We will review the supplement Organix Labs Focus Power in this review. 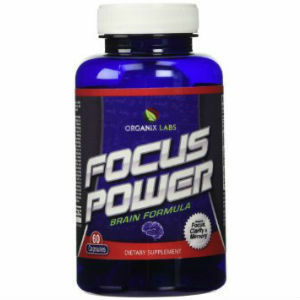 This supplement is supposed to boost brain functions like concentration, memory, concentration, focus and mental clarity. It is also designed to give your brain what it needs to work at an optimal level. We are sure that you want to know what ingredients are in it and what we make of it so read on to find out! Ginkgo Biloba increases blood flow to the brain, aids memory, and enhances cognitive function. Phosphatidylserine Complex supports the improvement of learning, memory and recall and is needed for healthy brain function. St. John’s Wort is supposed to aid emotional health so it can be helpful when under stressful conditions. Acetyl-L Carnitine helps energy levels in the brain. DMAE Bitartrate is supposed to boost concentration by increasing the production of acetylcholine in the brain. Bacopa Extract is an antioxidant that is also meant to improve memory and brain cognition. Gelatin is found in this product so it is not vegetarian. A single capsule is to be taken daily, with the dosage not to exceed two (2) capsules in a day. These dosage guidelines seem to suggest that this supplement is particularly potent. Dietary supplements should be included in a balanced diet. Possible side effects include skin irritation and redness in those exposed to strong sunlight, may cause seizures in those with a history of seizures, may affect fertility and inhibit blood clotting. Expectant and nursing mothers, children under 18, those with a medical condition and those on MAO inhibitors should consult with a medical professional before taking. Focus Power can be purchased through Amazon for $26.97 and is selling for $42.97 at full price. This price is for a 60 capsule bottle. The manufacturer does not outline a guarantee on its website. However, the product falls under Amazon’s return policies. It is possible to return an item within 30 days of purchase and the condition the product should be in is not specified. As there is no special note attached, it seems that the product can be returned to Amazon either in its original condition for a complete refund, or in an opened or used condition for a refund up to 50%. However, there is no assurance that the supplement can be returned or refunded. This product received mixed reviews and some of the comments indicate that some customers had a desire to return the product but did not know if they could. Focus Power seems to have worked for some people but not worked for others. Focus Power is a reasonably priced product, especially considering that it seems to be potent as only one capsule a day is needed and there is a very clear limit on how many can be taken on a daily basis. Despite the apparent potency, the supplement has received critical reviews from customers suggesting that it is ineffective. Furthermore, there was obvious confusion about how the product could be returned, if at all, and there was no clearly outlined guarantee. The manufacturer does not have GMP Certification, there product cannot be taken by vegetarians and may be unsafe for children. The product also comes with an uncomfortable number of possible side effects on one’s health. Ultimately, Focus Power seems that it can only fulfil the needs of very few and carries some risk. Henry Costa	reviewed Organix Labs Focus Power	on November 19th	 and gave it a rating of 3.